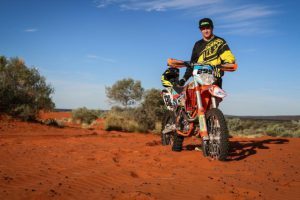 The Tatts Finke Desert Race is a yearly Australian off-road two-day desert race for motorbikes, cars, buggies, and quads. It runs from Alice Springs to the small Aputula (Finke) community, a distance of 460km (288 miles). It is one of the Northern Territory’s biggest and richest annual sporting events. Each year it attracts over 600 competitors from all walks of life. The ‘Finke’ and the June Queens Birthday long weekend have become a big thing in Alice Springs, which is organized and run by a local committee made up entirely of volunteers. Over race weekend about 300 volunteers assist with the running of the event. Back in 1976, a group of local dirt bike riders organized a “there and back” challenge race from Alice Springs to the Finke River and back. 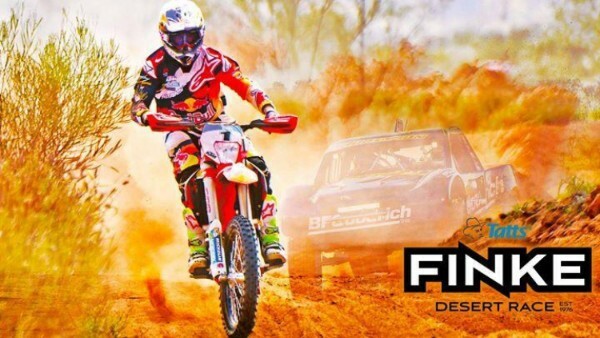 Due to its success, the Finke Desert Race was born and became an annual event. The course runs along sections of what was the old Ghan Railway service track which runs adjacent to the railway line. The terrain is typical of outback Australia – red dirt, sand, spinifex, mulga and desert oaks. The railway was realigned in the early 80s and the tracks removed, but the race continues along its original course. It was originally a bike only race, but as its popularity grew, cars and buggies were also included in 1988. A rivalry developed between the cars and bikes with each keen to claim the ‘King Of The Desert’. The bikes won the title for 11 straight years, until 1999, when a buggy was the first to win the overall prize. The bikes won the title back again in 2000 and 2001, with the buggies winning again in 2002, 2003 and 2004. Since 2005 the cars and bikes no longer race together, and there have been two ‘King Of The Desert’ titles ever since, one for cars and one for bikes. There is still a lot of interest in who completes the round trip quickest. More than 100 cars and 500 motorbikes competed this year. 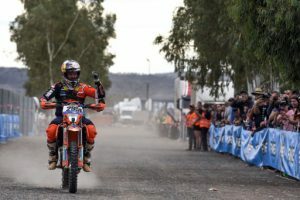 Five-time Finke winner and former Dakar champion Toby Price has just won his sixth ‘King Of The Desert’ title riding his factory Red Bull KTM500EXC. Toby was attempting a double win, this year he competed in both the motorbike section and the car divisions. Unfortunately, he wasn’t so lucky with the Red Bull Trophy Truck after they suffered a power steering failure on the return run back to Finke and failed to finish. Toby’s 2018 win gives him the most bike titles of all time, a feat even more impressive given he competed in the bikes and car sections this year. He finished the grueling 460-kilometer course in 3 hours 55 minutes 25 seconds. Alice Springs local David Walsh finished in second place after starting the race from 28th position. David Walsh has now finished Finke three times in second place, all behind Toby Price! In 2016 he joined the KTM factory team. 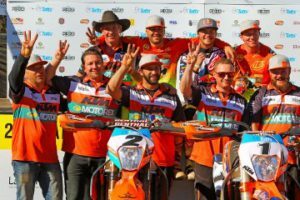 Six of the top 10 places were taken by KTM500EXCs. 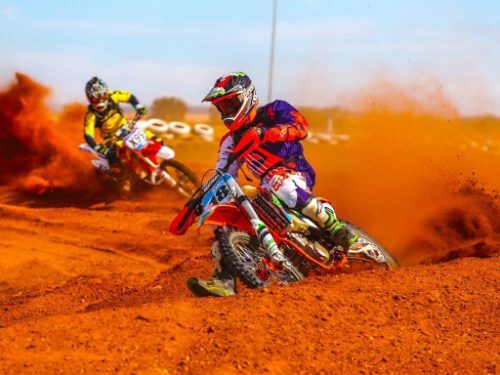 Have you ever been to, or competed in the Finke Desert race? What is your favorite dirt bike event worldwide? Share your thoughts below.